A hallmark of our education programs is a dedication to customization and relevancy. We strive to tailor all of our instruction to reflect the specific challenges and requirements of our clients. By combining expert design and development with esteemed instructors and top guest speakers, we are able to deliver quality training programs of virtually any length that are guaranteed to be applicable, engaging, and memorable. Omnis has trained over 7,000 individuals since 2006. 98% of participants state in their feedback they would recommend the course to a colleague. 90% answer 'essential' and 'significant' to the question regarding whether course material is applicable to their jobs. We provide courses at our facilities or at the client's facility. 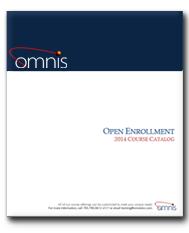 Browse our Open Enrollment Course Catalog then fill out an open enrollment form below or email training@omnisinc.com to register for a course.